Beleef de belangrijkste bezienswaardigheden van Bermuda op een 5-uur durende tour langs het cirkel-eiland met de touringcar. Je vertrekt vanaf King's Wharf en bezoekt de Royal Naval Dockyard, waar je meer te weten komt over de Britse koloniale overheersing van de jaren 1600 van je gids en de beroemde roze zandstranden van Horseshoe Bay te zien krijgt. Ophalen en afzetten van de cruisehaven is inbegrepen. I would recommend this tour, if this is your first visit to Bermuda. Excellent overview especially if you are planning to spend a couple of days there. My first visit to Bermuda didn’t disappoint. We scheduled the one tour day with Juanita. Our day was comprehensive, timely, informative, and fun. We had such a great time with Juanita that we scheduled a second day. I believe in the day and a half that we were in Bermuda we saw most of the visitor highlights. Certainly enough joy to leave us wanting to return. Juanita was certainly part of the joy. Her energy, local knowledge, personality, efficiency and certainly her driving capabilities were impressive. We chatted about our Bermuda tours with jusnita for days as a highlight of our cruise! 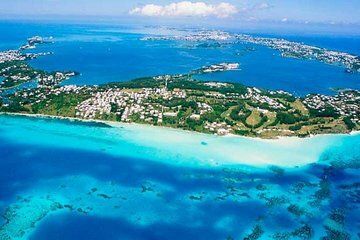 The Island Wrap Around Tour of Bermuda is a must. Juanita was the best tour guide and shared so much information about the island. The best way to see the best of Bermuda in a short amount of time is to take this tour!!!! The tour covered a lot of Bermuda , with stops in both Hamilton and St. Georges. Several short photo stops were also part of this tour. Definitely recommended. Somewhat disappointed that Juanita was not our guide. We drove around in a mini bus for the most part and only made a few stops. My wife and I were expecting a lot more. At 6 ft 3 it was not a lot of fun with very little leg room. At 75 a head it was not a great bang for my buck. This lady is very rude. She considers herself a separate entity than the booking agent such as Viator. She is not at all accommodating for minor things like 30 seconds extra time to take a picture of something where she is dropping off others. Very very rude and authoritarian lady. If you have kids then good luck dont book the tour. If you book the tour with her then you will understand what I meant and you will regret. Little detail about the tour below. 1st stop at a 100 year old church to explain how Bermuda roofs are functioning as water collection and treatment units. 2nd stop at the edge of road to take pictures of the pink beach from around 2000 feet height from the roadside. 3rd stop at the golf course to use restrooms. 4th stop at lighthouse with 180 steps to top. The view is no better than the view at bottom of lighthouse. This lighthouse is very old and not kept in good condition. But if you want to do it then go for it. But remember she expects you to go 180 steps up and 180 steps down in 5 mins. Total stop is 15 mins. 5th stop at the Hamilton downtown new capital. This is for you to purchase and do shopping. Nothing special. 6th stop at St. Georges downtown old capital. The only thing over there is a 10 mins show about punishing women for gossiping about their husbands. The free WiFi is not throughout the tour. Only towards the last 5 mins. Overall very boring tour for the kids but you can good information about Bermuda if you ask good questions remember you need to ask. Stay away from the tour with this rude lady. thought we had missed trip due to late ship arrrival Saw tour co-ordinator who advised another bus.was on its way. Phew! This was certainly the best tour to see every point of interest of Bermuda!